Karen Zukowski · Is anyone home? 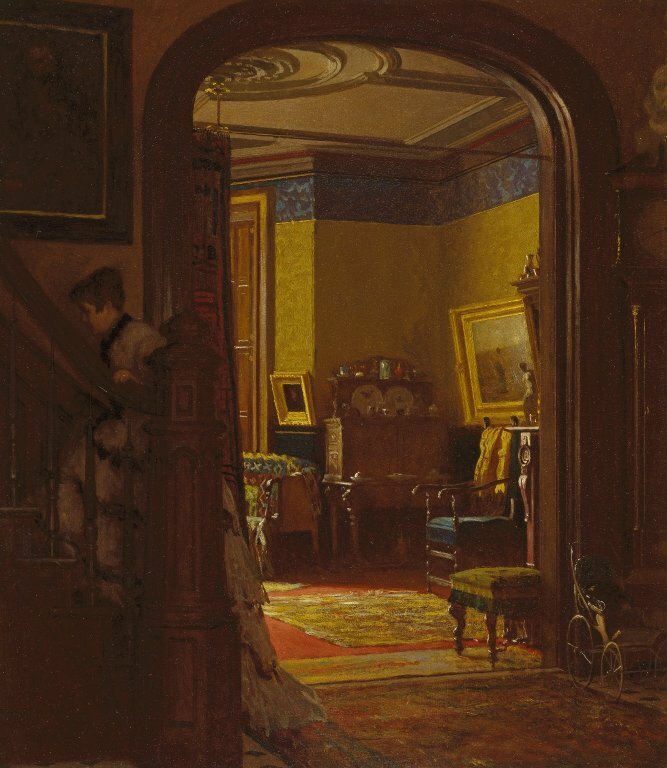 In this painting, the woman sneaks upstairs to avoid a visitor. She is taking advantage of the elaborate conventions of the late 19th-century surrounding the custom of calling. Ladies would establish “at home” hours and therefore were duty-bound to receive all callers who came during the appointed time. Callers were paying their respects to the hostess and her household, and by receiving them, the hostess acknowledged a a formal tie to the caller. In Eastman Johnson’s painting, however, the hostess has determined that her caller does not merit her attention. She is withdrawing upstairs, so she can have her servant declare that the mistress of the house is “not at home.” We do not know if the caller has presumed a social connection that does not exist in the hostess’s mind, or if the hostess is rudely snubbing her caller. To me, her hunched shoulders suggest anxiety. In contrast, the rest of the scene suggests domestic bliss. A lovely parlor done in yellows, blues and reds, bathed in a warm light from a bay window. Paintings, ceramics and other bric-a-brac, and a cast of the Venus of Milos, as well as deeply-upholstered furniture — this is a home of culture and comfort. The pram in the lower right corner tells us that the hostess is a mother. She is responsible for upholding the social order and raising children in it. All things considered, it seems to me that the hostess finds herself reluctantly bound by a set of conventions that she has helped spin.